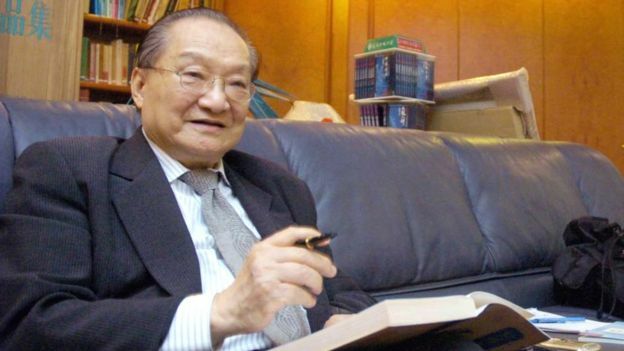 Louis Cha Jing-yong (查良鏞) (c. March 1924 – 30 October 2018), better known by his pen name Jin Yong (金庸), was a Chinese wuxia (“martial arts and chivalry”) novelist and essayist who co-founded the Hong Kong daily newspaper Ming Pao （明报） in 1959 and served as its first editor-in-chief. In addition to his wuxia novels, Cha also wrote many non-fiction works on Chinese history. For his achievements, he received many honours. Cha was born Zha Liangyong in Haining, Zhejiang in Republican China, the second of six children. He hailed from the scholarly Zha clan of Haining (海寧查氏), whose members included notable literati of the late Ming and early Qing dynasties. His father, Zha Shuqing (查樞卿), was arrested and executed by the Communist government for allegedly being a counterrevolutionary during the Campaign to Suppress Counterrevolutionaries in the early 1950s. When Cha was transferred to New Evening Post (of British Hong Kong) as Deputy Editor, he met Chen Wentong, who wrote his first wuxia novel under the pseudonym “Liang Yusheng” in 1953. Chen and Cha became good friends and it was under the former’s influence that Cha began work on his first serialised martial arts novel, The Book and the Sword, in 1955. In 1957, while still working on wuxia serialisations, he quit his previous job and worked as a scenarist-director and scriptwriter at Great Wall Movie Enterprises Ltd and Phoenix Film Company. In 1959, Cha co-founded the Hong Kong newspaper Ming Pao with his high school classmate Shen Baoxin (沈寶新). Cha served as its editor-in-chief for years, writing both serialised novels and editorials, amounting to some 10,000 Chinese characters per day. His novels also earned him a large readership. Cha completed his last wuxia novel in 1972, after which he officially retired from writing novels, and spent the remaining years of that decade editing and revising his literary works instead. He was a member of the Hong Kong Basic Law drafting committee but resigned in protest after the Tiananmen Square incident in 1989. In 1993, Cha prepared for retirement from editorial work and sold all his shares in Ming Pao. When receiving his honorary doctorate at the University of Cambridge in 2004, Cha expressed his wish to be a full-time student at Cambridge for four years to attain a non-honorary doctorate. In July 2010, Cha earned his Doctor of Philosophy in oriental studies (Chinese history) at St John’s College, Cambridge . Cha married three times. His first wife was Du Zhifen (杜治芬), whom he married in 1948 but divorced later. In 1953, he married his second wife, Zhu Mei (朱玫), a newspaper journalist. They had two sons and two daughters. Cha divorced Zhu in 1976 and married his third wife, Lin Leyi (林樂怡; b. 1953), who was 29 years his junior and 16 years old when they married. In 1976, his son Zha Chuanxia, then 19 years old, committed suicide after a quarrel with his girlfriend while studying at Columbia University. 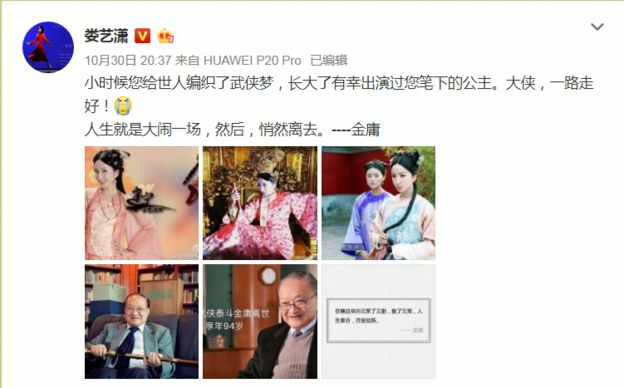 Tributes are pouring in from all across Chinese social media. The hashtag “JinYongDies” was viewed more than one billion times on Weibo. 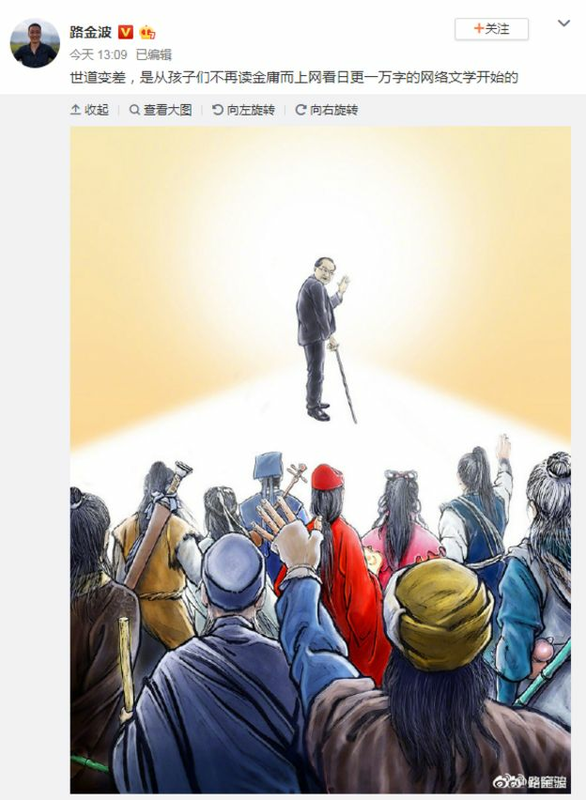 Fan art, showing Mr Cha waving goodbye to his characters, has also been circulating online. Many reminisced about the impact Mr Cha’s works had had on them as a child. “Asking all the Jin Yong martial arts fans out there – did any of you also tie sand bags onto your legs as a child, to practice Qinggong [a martial arts technique], because of him?” wrote user NicoleClassicLife. “He shaped my entire worldview of martial arts… it feels like a figure from my childhood is gone,” said another user on Weibo. “Looking back at Jin Yong’s works, I’m surprised to find that amongst all his characters, my favourites were almost all women. That’s probably because, in his world, the women were braver,” one wrote. “Thank you for bringing us so many classics – these brought me some of the best memories of my childhood,” actress Viva Ho wrote. At lunch one day with Louis Cha Leung-yung, the late author of the kung fu novels that inspired pretty much the entire fantasy universe of China today, he told me about how he was not alone in hoping that his works could achieve some measure of international recognition, commensurate with their impact in the Chinese world. Former Chinese leader Jiang Zemin, Cha said, was a great fan. Jiang had arranged for an emissary to visit the Nobel Prize committee and say it was time for a Chinese writer to get the prize for literature, and that the Chinese government believed Jin Yong, Cha’s pen name, was the right writer to be honoured. Cha was always eager to have his stories gain recognition globally, and in terms of their sheer cultural impact, there is no doubt he deserved that Nobel Prize. When I contacted him in early 1979, to say that I was translating his book, The Book and the Sword, into English, he was very enthusiastic and generous with his time. He made himself available to answer questions, and I used the opportunity to speak with him regularly, often on the phone. We spoke almost exclusively in Cantonese, a foreign tongue for both of us, but his accent was far stronger than mine. There had been only one translation of any his stories before I contacted him, and it was not well-regarded. I was busy doing many things at the time and it took me three or four years to finish it. I translated pretty much the whole thing, which, in the Hong Kong Chinese editions of the time, was two volumes and about 800 pages in total. I then put it to one side. It was about 15 years later that I was contacted – either by Cha or by Oxford University Press – about publishing it. Cha and OUP had created a plan with the master translator John Minford, who had done a large part of The Story of the Stone – an English version of Dream of the Red Chamber. The plan was that John would translate the entire Jin Yong oeuvre for OUP, the only exception, at Cha’s insistence, being The Book and the Sword. John did the first book to be published in the series, The Deer and the Cauldron, the last of Cha’s novels; mine was the second, published in 2004. The rest were never done by OUP, for reasons I am not privy to. Then came an edition of Legends of the Condor Heroes last year by another publishing house, MacLehose Press. But all of Mr Cha’s books have been re-published in a number of Asian languages, including Japanese, Korean and Vietnamese, the mother tongues of countries that share many of the cultural underpinnings of China. These works have all been filmed many times for television and the cinema. Many of the characters that Cha created have become a part of life for Chinese people, in much the way that Dickens’ Oliver Twist was a part of the lives of Victorian readers and the Harry Potter series is a part of our lives. The Book and the Sword was the first novel Cha wrote. The story has a panoramic sweep which takes as its base a few unbeatable themes: secret societies, kung fu masters and the sensational rumour – so dear to Chinese hearts – that the great Manchu emperor Qianlong was in fact Chinese and not Manchu. It mixes in the exotic flavours of central Asia, a lost city in the desert guarded by wolf packs and the Fragrant Princess. This lady is an embellishment of an historical figure, although whether she actually smelled of flowers, we will never know. I am not a professional literary translator, and I learned Chinese on the streets. I started translating the book to help improve my Chinese, but after a while other ideas impinged on the process. Maybe it could be published in the West, I thought, and become a big success like Eric Van Lustbader’s The Ninja and James Clavell’s Shogunand a bunch of other popular novels of the era with intensely Asian themes. It did not happen, although the OUP edition sells steadily in small numbers. The main reason, I think, is the style of the storytelling. Which is ironic, because in Chinese terms, Cha’s writing was a huge leap in the direction of Western literary methodology compared with his forebears. Apart from the subject matter – often dramatic events from Chinese history that mean nothing elsewhere – the amount of description and the things described and not described, I think, make it difficult for Western readers to relate to Cha’s work. Cha was writing for a Chinese reader who could visualise scenes and clothes and situations that would require significant explanation to be clear for a non-Chinese reader. The rules of dialogue were also somewhat different and the story arc did not necessarily match what a Western reader would expect. Some of the fight scenes go on and on and on. Some culturally specific plot developments, which made sense in Chinese terms, wouldn’t necessarily make sense to those who did not grow up in the culture. I am thinking – why, I wonder? 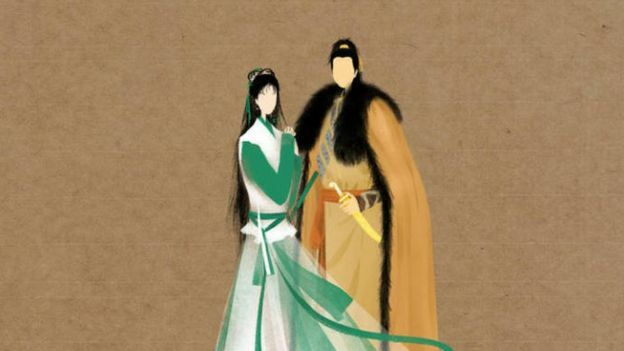 – of how The Book and the Sword’s hero, Chen Jialuo, spends an enormous amount of time alone with the Fragrant Princess in the desert and never makes a move on her. So I decided that something had to change, and the rule I set for myself as I edited my draft translation was that I could cut, but not add. A couple of sub-plots disappeared and many of the fight scenes were cut back dramatically. Cha was writing in those days to fill space in the newspaper and the more words he wrote, the more space he filled – just like Dickens. I once asked him about all the flowery names he gave to the kung fu fighting moves and weapons and whether they precisely described things he knew of. He said, no, he was largely just making it up to sound colourful. That was a relief for me. So I tried to be as faithful to the spirit of the original as I could be, and simplified some elements of the story and the writing to make it more acceptable to an English-reading audience. I of course checked this with Cha and he agreed with my approach. As a result, there are some differences between the original and my translation, but they are differences only of omission. In other words, I have added nothing. It was different with The Deer and the Cauldron. I cut and simplified, while John embellished and changed. There was once a discussion between John and myself at the Hong Kong Translation Society where I had been invited to speak on my translation of B&S. I have a recording of it. Basically, John’s view was that the translator had a responsibility to enhance Cha’s work to make it acceptable for publication in English. I disagreed with this approach. The problem with it is that the reader cannot then know what is Cha and what is John Minford. With my approach, you can at least be sure that everything there is Cha. The Chinese diaspora turned out to be the natural market for English versions of Cha’s books, at least in the short term. Hundreds of people have contacted me over the years since The Book and the Sword was published to ask when I would do another one, and, interestingly, almost all of them are people of Chinese ancestry living in places like Canada and Australia. They understand the cultural context because of their family background, but they cannot read the Chinese books. So an English version is, for them, a godsend. 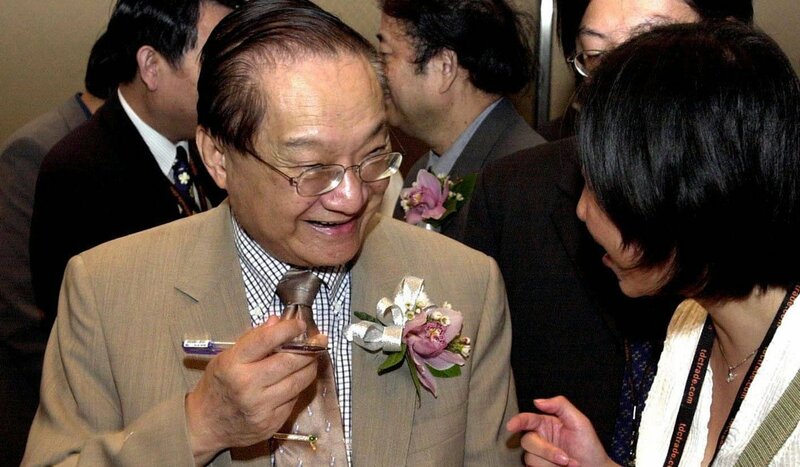 The problem of getting the works of Louis Cha across the cultural gulf and accepted in the Western world is not going to be solved any time soon. Yes, they are popular novels. But they are also deeply reflective of Chinese culture, with deep roots in Chinese history, language and nuance. The integration of Chinese culture into world culture is very important, and it will happen eventually. When it does, Cha’s stories and characters will be an important part of it. It is just a shame it did not happen in his lifetime, as he deserved.